← Our Oil Problems are Not Over! As the US heads toward debt default and continues with government shutdown, the underlying reason for the predicament is generally not clear to the American people or the world. The story that the press has generally been feeding us places the problem as basically a temporary one, caused by conflicts between the Democrats and Republicans. It seems to me that the problem is much deeper. In this post, I summarize the two views, and provide reasons why the Predominant View is very far off the mark. We may be headed for a financial collapse that the Predominant View misses completely. The world economy under “normal” circumstances grows. Economic growth can sometimes slow a little, and then a little Keynesian stimulus is needed. Such stimulus would typically include deficit spending and low-interest rates. Perhaps it would include “Quantitative Easing” as well, since it tends to stimulate interest in buying assets of all kinds. With the Predominant View, economic growth can continue indefinitely, without slowing down or stopping. In fact, the pursuit of economic growth becomes almost a national religion, with Ben Bernanke (probably succeeded by Janet Yellen) as its high priest. With unlimited economic growth, it is easy to have our current monetary system, since debt, and the repayment of debt, “works” well indefinitely. In fact, we can have pension plans, Social Security, and the many wonders that our financial system can deliver. We also can have more and better technological innovations, because there is always an abundance or the resources needed to make these innovations. The late economist John Attarian describes this secular religion under the name “Economism” (Attarian 2005). According to him, under Economism, one’s life purpose is to attain affluence, so as to maximize access to consumer goods. With this belief, affluence is the universal solution to problems and grievances. Give people enough money, jobs, goods and services, and they will be happy and peaceable. With this view, the big problem in the future is pollution, and in particular climate change caused by carbon dioxide and other gasses affecting the climate. Coal is viewed as particularly bad in this regard, oil is somewhat less bad, and natural gas better yet. Nuclear is a concern for a variety of reasons, including lack of a place for spent fuel. To prevent/mitigate climate change, the view is that we must take steps to reduce fossil fuel usage over the next forty years. The view is that improved technology is likely to be helpful in this regard, because new technology will allow us to become increasingly efficient in our use of fossil fuels. “Renewables” can perhaps be ramped up greatly. Birth rates can likely be reduced, through increased education of women. If there is a problem with a declining amount of resources per person, this problem can be mitigated by sharing what we have more equally. Perhaps job sharing can become more common, with each worker having part of a job. Sustainable solutions are viewed as ones that use less fossil fuels. The “plan” is to have ever-increasing GDP per unit of energy consumption. The economy will become ever more service-oriented. People will learn to be happy with more services and fewer goods. We can move forward to a sustainable future. With this view of the future, the economy is fundamentally fine. It will return to stronger growth in the near future, perhaps using less energy. The huge amount of stimulus currently being put into the economy through ultra low-interest rates and Quantitative Easing can be dropped back, without adverse results. With the Federal Reserve in charge, and with similar groups in charge in other countries, there is nothing to worry about. Problems with government debt in the US, many parts of Europe, and Japan will somehow take care of themselves, if the various political parties would learn to get along better, and perhaps wait a bit for economic growth to resume on its own. This story is very different from the Predominant View. Energy is critical to the growth of human civilization, because all types of goods and services require energy for their production. Once built infrastructure has been added, energy needs to be of the specific type used by this infrastructure. In the world today, oil is the single largest source of energy. It is also the most versatile, and because of this, it is the most highly valued energy source. Extraction of oil has become problematic in the last decade, for two reasons: the quantity is not growing very rapidly, and the cost of extraction keeps rising. This rise in cost occurs because we extracted the easy-to-extract oil first. Now we have to move on to the more difficult (and expensive) to extract oil. I have referred to the rising cost of oil extraction as an Investment Sinkhole Problem. We invest more and more dollars (and quantities of resources of various types), but the amount extracted barely increases world-wide. Economists would call the problem declining marginal returns on investment. When oil could be extracted cheaply, there was a huge gap between the cost of extraction and the value provided to society by this oil. Now, as the cost of extraction has risen, the difference between these two amounts becomes much smaller. If we were depending on this difference to help fuel economic growth, we are losing this benefit. Viewed in terms of feedback loops, the huge amount of value added to society by oil over and above its cost of extraction used to lead to a positive feedback loop, favorably affecting economic growth. For example, (a) taxes on oil extraction would provide significant revenue, and (b) with low oil prices, roads could be built very cheaply. Both situations benefitted the economy. Now at a higher cost of extraction, the value added to economies around the world is lower, leading to lower economic growth. At some point, not far away, the cost of extraction will exceed the value that this oil provides to society. At such a point, it will no longer make economic sense to extract oil. Adding more high-priced oil will lead to economic contraction, and quite likely, ultimately, collapse. Joseph Tainter in the Collapse of Complex Societies (1990) tells of many civilizations that reached declining marginal returns of investment and ultimately collapsed. Figure 1. Graph of total, average, and marginal product, based on a quadratic production function, from Wikipedia. and X1, X2, X3, . . . Xn are quantities of factor inputs, such as labor, capital, and land or raw materials. Using the production factor approach, oil needs to be one of the Xi variables, because it is critical to the function of the economy. Oil is important for transportation, agriculture, as a lubricant, and as a raw material used in making many products such as medicines, fabrics, and asphalt. Substitutes for oil are very limited–mostly ethanol, which acts as an oil extender. Figure 1 represents the situation where only one the of the inputs, in this case, oil, is allowed to vary. We are rapidly reaching the point where the cost of extracting oil is so high that in total, society is worse off, in terms of the total amount of goods produced by society. On Figure 1, we are reaching Stage 3. The fact that we are reaching diminishing returns with oil is a major reason why world economic growth is slowing. It is also a major reason that many of the heavy oil consuming nations have been struggling with recession-like symptoms. These symptoms are mostly being covered up with deficit spending, ultra low-interest rates and Quantitative Easing. If this stimulus ever stops, there are likely to be huge problems. Debt is very much tied in with this story. GDP is a measure of how much is produced, whether or not debt is involved. Thus, if a new house or a new car is built, the value of the car is included in economic growth calculations, whether or not the house or car is bought 100% on credit. Not only are we reaching limits on oil production (because the cost of extraction is becoming higher), but we are also reaching limits on debt, because economic growth is slowing. Figure 2. Author’s image of an expanding economy. The fact that adding debt is easier in a growing economy than in a shrinking economy is obvious, if a person thinks about it. Another situation where debt works well is if the economy is close to flat, but with debt, it is possible to add inexpensive fossil fuel energy. In this case, the value to society in terms of the work performed by the fossil fuels in far in excess of the cost of extracting the fossil fuel energy. This difference can feed back into the system, through cheap infrastructure, rising tax revenue, and even rising wages of workers, helping economic growth along. Thus, even though the economy was not growing at the time of the initial loans (these loans would be to potential consumers, to potential factory owners, and to potential extractors of the energy), the debt did in fact enable growth, by helping the huge difference between the cost of extraction and the value to society of the energy flow through to the economy. Figure 3. Author’s image of declining economy. A shrinking economy can handle much less debt. Businesses, instead of seeing economies of scale, find that fixed costs are increasingly high compared to sales. Thus, their profits tend to shrink, even before debt service is added. Workers experience layoffs frequently, and often find that their new job pays less than their old job. This problem makes debt repayment difficult. If the economy is in fact reaching Stage 3 in Figure 1, because of diminishing returns with respect to oil, additional debt simply pushes the economy toward collapse more quickly. There are two reasons why increasing debt is important for economic growth. First, increasing debt gives governments, businesses, and individuals increased spending power. For example, with a new auto loan or new home loan, a person is able to purchase an automobile or a home. This aspect or increasing debt is referred to as “increasing demand”–really the increased ability to afford goods. If debt is declining, the situation is similar to the situation where few new loans are given–instead the old loans simply need to be paid off. If these are home and car loans, the number of cars and homes sold would likely drop back greatly. A second aspect is just as important. The increased demand tends to lead to higher prices. For example, suppose mortgages for homes suddenly dried up. The amount a person could get for selling his house would likely drop. The same problem would happen if car loans disappeared–there would be many fewer buyers for cars (even used cars), and the value of cars would tend to drop. The value of commodities in general would likely drop as well, because there would be fewer cars made. The fact that fewer cars are made would feed back and affect steel prices, oil prices, and prices of other components of automobiles. A related issue is that if the amount of debt starts to drop, the feedback loop is such that it tends to encourage more contraction, lower prices, and more debt default. (Like 2008!) Such debt defaults can cause banks and insurance companies to collapse, unless propped up by the government. Lower commodity prices can lead to a cutback of oil production. The expected feedbacks are especially bad if the economy is already reaching Stage 3, in Figure 1. At this point, we have a great deal of oil extraction that is financed by debt. As we get to the more expensive oil, there will be more of this that can never be paid back. The tight oil extracted using fracking from shale formations is quite possibly of this type. The president of Shell Oil Company recently explained what a disappointment its investment in shale oil and gas had been (Financial Times). Brazil is a step further toward bond defaults. It is trying to extract expensive oil from below a salt layer offshore. Brazil’s second largest oil company recently was not able to make its debt payment, and is now being liquidated (Bloomberg). The debt rating of its largest oil company, Petrobas, was recently downgraded (Financial Times). A person cannot help but be concerned that if we start to see debt defaults, there will be contagion as prices drop and banks and insurance companies fail. The government is already stimulating the economy using super-low interest rates, deficit spending, and Quantitative Easing. It would seem to be running out of ammunition to fix the situation, if another round of debt defaults start. Former Director of the US Office of Management and the Budget, David Stockman, has recently talked about this issue (King World News). Electricity can be produced in many different ways, at vastly different costs. When electricity costs are low, low electricity costs also contribute to economic growth, because the cost of generating the electricity is significantly lower than the benefit to the economy from the electricity. In this respect, electricity is very much like oil. We can think of oil and electricity both as intermediate products, that are not exactly what we as consumers can use. What we want is transportation, or light from a light bulb, or our food cooked. Our salaries only go so far. Once the share of our salaries that must be spent on these intermediate products (electricity or oil) starts increasing, the share of our salaries that can go for the applications we really want must shrink. Similarly, if more of the world’s resources and manpower go to creating wind turbines and solar panels and nuclear plants, less is available to produce other things. Renewables are an order of magnitude less efficient in producing electricity than the fossil fuels they replaced, when the energy cost of mitigating intermittency is included in the calculation (Weissbach et al. 2013). EROI comparisons are distorted, because they do not reflect this cost. Renewables tend to use fossil fuels heavily at the beginning of their life cycle, so do not really reduce fossil fuel use unless at some point in the future, we greatly reduce the amount of renewables we produce (and perhaps not even then, if the intermittency cost is as high as indicated in Item 1). The shift toward renewables in electricity production acts very much like the push toward high-priced oil, in terms of pushing the economy toward Stage 3 of the production function (in Figure 1), only on a different axis than oil. The view that the economy is hurtling toward climate change is based on the view that the economy will in fact continue to grow and will continue to extract fossil fuels for the foreseeable future. If oil and debt are limits that we are hitting right now, we may very well encounter economic collapse in the near future. Such a collapse will likely cut fossil fuel use of all kinds very quickly, because of low prices and disruption to systems. Governments are perhaps the most vulnerable part of the system, if collapse hits due to continuing high oil prices. Governments are the ones charged with bailing out banks and providing benefits to unemployed workers, at the same time that their own tax revenue is down due to reduced employment. In fact, many of the governments of big oil consuming nations (US, most of Europe, and Japan) are in very vulnerable positions, because their debt levels are very high, and they keep adding more debt. At the same time, they are pulling out all of the stops to keep their economies from collapsing, including very low-interest rates and Quantitative Easing. Because they are already so stretched, it is doubtful that they could do another round of bailouts. The US government shutdown and debt cap limit debate is indicative of very serious problems–more than a conflict between two political parties. With slowing economic growth, there is a huge gap between what has been promised and what the government can in fact afford. No government official wants to explain to voters how bad the situation really is. So we end up with gridlock. See my post from November 2012, Understanding Our Oil-Related Fiscal Cliff. The Predominant View appears to fall very wide of the mark. Limits on oil and on other resources are a signal that Nature is really in charge, not humans. We can’t escape these limits. If we try to mitigate climate change by using more renewables, we hit a different kind of limit–high-priced electricity, and the problems it brings. Potential collapse seems to be directly in front of us. The Republican solution of more oil drilling will lead us in the direction of collapse, just as will the Democratic solution of increased debt and more emphasis on low-carbon fuels, particularly for electricity. 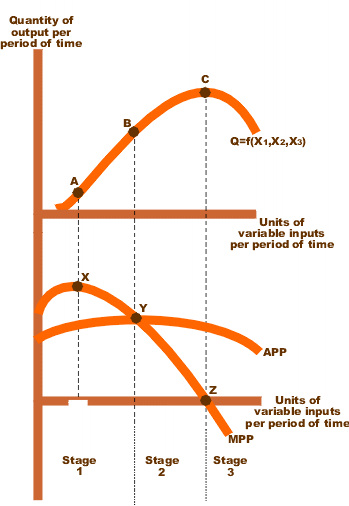 The limits are just on different axes of the production function. Whether or not we humans would like to be in charge, Nature is, in fact, in charge. Nature determines timeframes. The timeframe could be very close. It is even possible that the current government shutdown/debt ceiling problems will ultimately lead to US collapse, and perhaps even world collapse. The current Predominant View of our situation is one that puts humans, and in particular current governmental officials, in charge. Historically, governments have had close ties with religion, using religion to further their own purposes. Now, government and religion have almost been fused into one. Perhaps this close tie is the reason why it is so difficult to get a well-reasoned story about our current predicament from those in charge, and why so many people are willing to believe the story we are being told. One thing that the Predominant View misses is the fact that we live in a finite world. This means that growth must at some point slow, and ultimately be reversed. The world operates in cycles; we can’t really change this. Nothing is permanent. The species that are dominant will change; humans may even lose their dominance. The climate changes, although perhaps not as fast as it is currently. Another thing that the Predominant View misses is the fact that energy of the right kinds is absolutely essential for the functioning of the economy. The view that there will be a substitute is more “faith-based” than it is based on objective facts. The Predominant View also misses the point that the substitute needs to be cheap; high-priced energy is terribly bad for the economy–it can easily push the economy into Stage 3 of the production function. The fact that high-priced oil is likely to lead to a debt unwind is likely to make the situation worse than it otherwise would be. A major debt unwind is likely to lead to low prices for oil and commodities of all types and significant job loss. This is analogous to the problem the 1930s Depression. The big difference is that in the 1930s Depression, job loss was associated with the falling price of food, as fossil fuels replaced human labor, bringing food production costs down, and leaving many unemployed. (Stiglitz 2010). In that scenario, there was still plenty more cheap fossil fuels in the ground. Therefore, more debt and stimulus programs could re-inflate the economy, because it could lead to more use of cheap fossil fuels in non-agricultural sectors of the economy. We are now at the edge of a very different scenario. We are reaching debt default limits because we have extracted the easy to extract oil. Additional extraction can only be more expensive and thus push us further into Stage 3 of the production function, or more toward financial collapse. As the economy naturally shrinks, there is no longer a way that more debt can re-inflate the system. Instead, the use of debt must reach a new, much lower equilibrium. Because of debt’s tie to banks, pension funds, insurance companies, and the rest of the financial system, this is a huge problem. We can think that the growth of human systems, including the economy, will go on forever, but we are almost certainly kidding ourselves. At some point, when Nature decides, new species will dominate–perhaps plants that can use more CO2. The transition will be the transition Nature dictates. We are kidding ourselves if we think that we can decide to slowly reduce oil and fossil fuel usage over the next 40 or more years. If oil prices drop to, say, $30 barrel because of debt defaults, oil production will drop very quickly–not based on some slow decline curve. Natural gas and coal prices will drop dramatically too, essentially putting an end to their production. Jobs will disappear with the lack of fossil fuels. Eighty or ninety percent of us will again need to work in manual food production without fossil fuels. Education, government, and services of all kinds will shrink rapidly. Nature is deciding for us right now what is ahead. We likely will have little choice in the matter. If we do have a choice at all, it is likely to be in the direction of serious back-pedaling, in terms of population, and in terms of learning to live essentially without fossil fuels. The future is likely to be very different from the past. This entry was posted in Financial Implications and tagged alternative energy, collapse, debt default, government debt, oil price, production function, recession. Bookmark the permalink. This welfare-based shadow- life contrasts with the life of an English peasant family I’ve been reading: the grandfather lost his farm as a result of globalization in the 1880’s (competition from the Colonies ) and they got back on their feet by 1/ Working hard in waged jobs to save capital, 2/ Put the farm they leased back into basic productivity through hard manual labour (no plough horse at the start). Essential pre-conditions of success, apart from good health and knowledge, were: 1/ A good spouse brought up to the farming life, 2/ A pig for meat, and, 3/ Hens for eggs – ‘we wouldn’t starve’. And decent neighbours. A stable family unit did not guarantee success, (we forget how common it was for farms to fail) but it was a pre-condition of it. This is not an anti-welfare diatribe, and these people lived in fear of the workhouse – one of the cruellest systems to punish the poor ever devised – but much has gone very wrong.